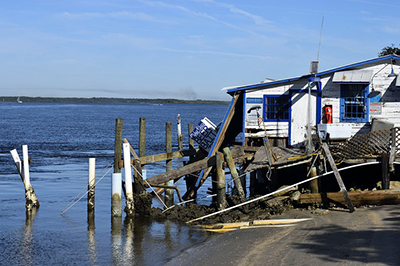 While flood insurance can greatly reduce the cost of flood losses and rebuilding, there are six mitigation measures that can help prevent your house from flooding in the first place, even if you live in a special flood hazard area. If your house has sustained previous damage or is at high risk, one of the following mitigation projects may be a good investment and give you peace of mind. Structural Elevation - Raising your house so that the lowest floor is above the flood level. This can be done by elevating the entire house, including the floor, or by leaving the house in its existing position and constructing a new elevated floor within the house. The method used depends largely on construction type, foundation type, and flooding conditions. Wet Flood Proofing - Modifying the uninhabited portions of the house (crawlspace or unfinished basement) so that flood waters can enter but not cause significant damage to either the house or its contents. This allows interior and exterior hydrostatic pressures to equalize, reducing the likelihood of wall failures and structural damage. Relocation - Moving your house to higher ground, outside the flood hazard area. When space permits it may be possible to relocate the house to higher ground on the same piece of property. Once relocated, utility lines are connected. Dry Flood Proofing - Sealing your house to prevent flood waters from entering. Making the house watertight requires sealing the walls with waterproof coatings, impermeable membranes, or supplemental layers of masonry or concrete. Doors, windows, and other openings below flood levels are equipped with permanent or removable shields and backflow valves must be installed in sewer lines and drains. Demolition - Tearing down a damaged or high-risk structure and either rebuilding properly somewhere on the same property or moving to a house onto other property, outside the regulatory floodplain. Acquisition of Flood-Prone Properties - Properties that meet FEMA's definition of repetitive flood losses may qualify for acquisition by federal, state and local governmental agencies with the stipulation that the land be maintained as open space and not be redeveloped. Clearly, these measures are not cheap, but in the long run they may save you tens of thousands of dollars and a lot of grief. If you have a history of flood insurance claims, you may be able to get some financial assistance for the above-mentioned projects. Explore these options with a qualified professional. Your local building department will explain permitting and regulatory requirements that apply to such projects.